The Only Dance Journaling Guide That Reminds You When to Write! You have big dreams. But you’re savvy enough to realize there’s no silver bullet or magic potion that will make you a better dancer. Instead, it takes drive. Enthusiasm. Determination. Gobbling up the lessons and advice of teachers and mentors. Showing up. Doing the work. Investing the time. Dance is complex. Becoming better at it is a process that takes more than a little self-motivation. There are lots of tools dancers use to get and stay motivated but keeping a record of your thoughts, questions, goals, progress, and experiences in dance has proven time and again to be effective for taking students like you to the next level. Whether you call it a journal, diary, or notebook, you use this record to process your progress and motivate you forward in your study. But, if you’re like me, you’ve struggled with journals. How do I make writing and recording a habit? For me this was always the hardest part. I’d get off to a good start, forget a day or a week and before I knew it months had gone by without touching that notebook. I’ve seen my own students face the challenge of consistency in journal-keeping. You may also wrestle with perfectionism, a desire so strong to do things “correctly” that you hesitate to take action at all. Many dancers do. What should I put in my journal? When is the best time to write? Am I doing this the right way? Is my journal really helping? You’ll progress and improve faster when provided with guidance and take-home strategies that teach and tackle the whole dancer – one that thinks and feels as well as moves and grooves. But what if your teacher doesn’t have the tools or time to give the extra level of support that will make you a smarter and more driven dancer? A weekly message, delivered right to your inbox, 4 for 40 provides what I like to call e-motivation. 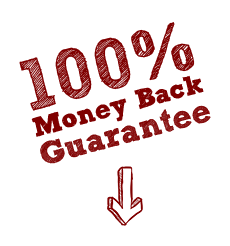 It directs you toward action, inspires your drive, and teaches you something with each installment. An inspirational quote to remember or record in your journal and apply to your week. At least one must-know dance term that will boost your dance vocabulary and understanding, not to mention impress your friends and teachers. An action assignment or challenge for the week designed to strengthen your brain, body, creativity, or commitment. 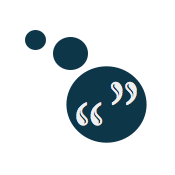 A writing or list-making prompt that solves the “What do I write about?” problem. I call my blend of creative or reflective writing and practical list-making, Dancescribing. YOU control when you’ll begin receiving your weekly e-mail. Since this e-course aims to keep you going throughout your “school-year,” simply tell us when your first day of class begins and we’ll take care of the rest. You get 40 weeks of e-motivating material. There are fresh concepts, actions, and prompts in the 4 components of our weekly e-mail to apply to any or all of your dance classes. Keep track of the exercises you like or want to continue using regularly and you’ll begin to discover your journaling style. Plus you’ll regularly receive bonus tips and links that better explain or help you understand certain topics. It’s the over-delivery that you’ve come to expect from Dance Advantage. There are free articles online (including right here at Dance Advantage) that give ideas for what to put in a dance journal. There are resources you can buy in bookstores that will guide you in your dance training and some may even give you space for reflection. Only 4 for 40 will reach out and give you a nudge each and every week, throughout 10 whole months of your dance study for less than what you’d pay for one private session with myself or another teacher. I love the structure of the email, complete with the quote, action items and breakdown. I highly recommend the series to students seeking a more mature approach to their training that will accelerate their understanding of movement theories and constructive methods of self-analysis. Who is 4 for 40 for? Students of any dance discipline who are willing to do the work to achieve their dreams! 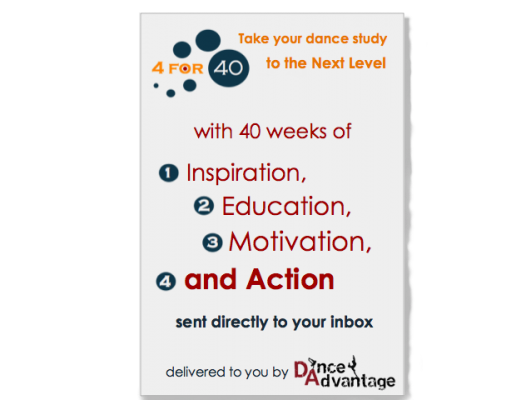 Designed specifically to give you an advantage, 4 for 40 transforms your dancing by making you smarter, stronger, and more equipped to reach that next level in your dance study. It reminds me of the Artist’s Way, yet geared for dancers. Several tasks were very inspiring to me as a teacher, not just what I think my dancers would like. Finally, a guided action plan for success that saves you money. The only way to back up moments of inspiration is with real action. So between Dancescribe prompts and assignments there is something for you to DO each week. As a dancer you don’t just use your body, you use your brain. So with given terminology and bonus material there is something for you to LEARN each week. Everyone needs help through the valleys – the inevitable parts of your dance year when motivation and energy are low. So with quotes and personal investigation for 10 whole months there is something to INSPIRE you onward and upward each week. The work for a dancer never ends when the class or exercise is over. The information processing and digesting that happens between is crucial to your success. So with every e-motivating e-mail there is something for you to THINK about during those transition times each week. Get the 40 weeks of mentoring for less than one private lesson. If you worked privately with a teacher, getting personal guidance through only a few of the topics covered in 4 for 40, it would cost you $150 or more. Teachers are busy with choreography and multiple students, so attending to more than just the technical parts of your dancing would be out of the question in one, two, even three hours of private lessons. 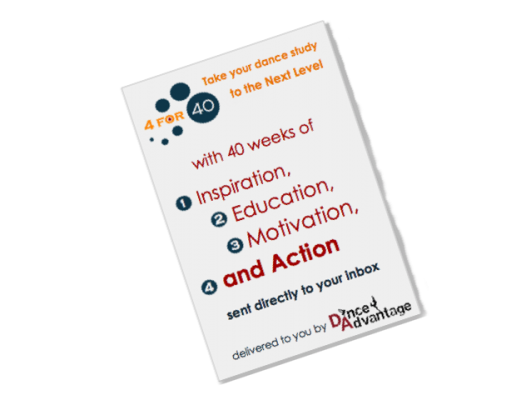 Now with this 40-week e-mail course you can jump in right away with extra professional support that gets results by addressing the WHOLE dancer. 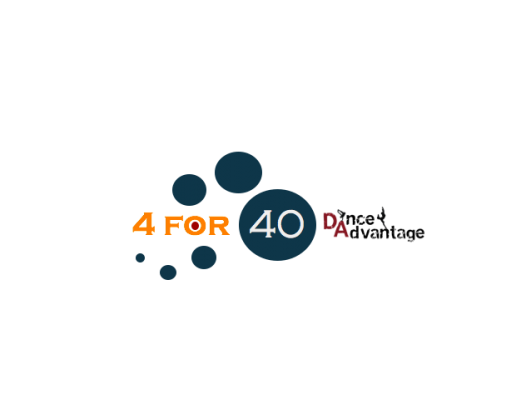 You can register for The 4 for 40 Dance Advantage e-course and be ready to begin your dance year on the right foot for a one-time payment of $44. I get e-mails from students all the time and the number one question I’m asked is “What can I do to improve?”. As a dedicated teacher, I want to help but the answer is never simple and I could never cover it all in one response. Through this e-course I can systematically help you unlock the doors of improvement by delivering you the keys to your success week after week. Don’t wait, get 4 for 40 now! It makes a great gift for your favorite student, too! The e-course challenges me to look beyond myself as a student and teacher and try new ways to move and think about dance. Our dance world is so large and encompassing but you have helped bring it down to bite size pieces. You have made dance more accessible to those of us who do not live close to large cities. My students and I thank you for broadening our horizons in dance. Isabelle Cook, Dance teacher and owner of Isabelle’s Dance Time. I’m certain that if you (or your child) complete the tasks offered in each e-mail that you’ll be delighted with the difference in your dancing and your approach to or focus in class. I am also positive that in using this e-course you’ll not only capture useful insight about yourself but pick up tools that you can continue to use long after the course is complete. However, because I value you as a student and customer, I want YOU to be positive you love it too. Therefore, if you are not completely satisfied with your purchase, you may cancel your subscription to the e-course at any time by contacting me with a note describing why you are disappointed. Naturally, I want to know how I can make it better. But without further question, I will issue a full refund of your money.